NBA Player Flouts A Critic's Guarantee That He Would Be Arrested : The Two-Way In 2010, sportswriter Clay Travis said in a tweet, "There is a 100% chance that DeMarcus Cousins is arrested for something in the next five years." Friday, DeMarcus Cousins of the Sacramento Kings reminded sports journalist Clay Travis that his five-year guarantee — that Cousins would be arrested — had expired. Today is a great day to be DeMarcus Cousins. Not only did he get to serve a chilly dish of revenge to a sportswriter who dismissed him in 2010; he was also chosen for the NBA's All-Star Game. 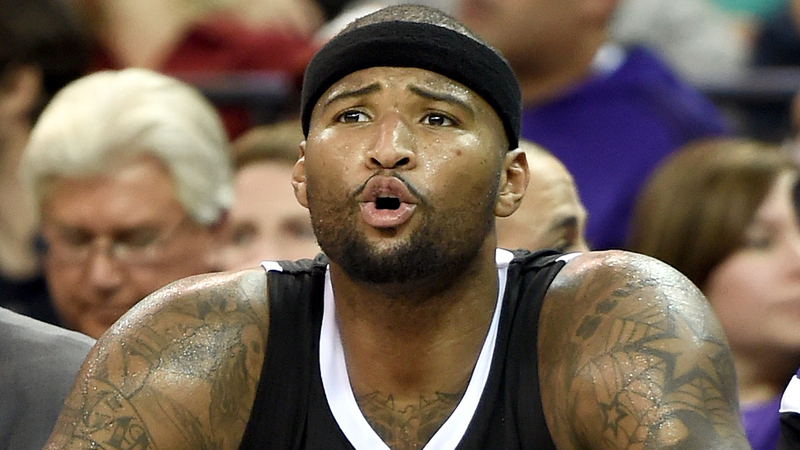 This morning, Cousins posted a photo of a 2010 tweet by writer Clay Travis, who wrote, "There is a 100% chance that DeMarcus Cousins is arrested for something in the next five years." Five years later, Cousins, who now plays for the Sacramento Kings, wrote, "Today's the day!! Let's all show him some love!!" In response, Travis, a writer who also appears on Fox Sports, wrote, "Incredibly funny and well played." Back in 2010, Cousins was a 19-year-old freshman on a talented University of Kentucky team that included guard John Wall. Cousins was an imposing 6-foot-11-inch center whose temperament was struggling to catch up to his physical gifts. Now more than ever, that struggle seems over: Friday, NBA Commissioner Adam Silver named Cousins a Western Conference All-Star as a replacement for the injured Kobe Bryant. Travis' prediction came in the same month that Cousins earned a technical foul in the first minute of Kentucky's game against rival Louisville for throwing an elbow during a scramble for a loose ball. Cousins had 18 points and 18 rebounds in that game. But his stats were overshadowed by the technical and by the impression that he had problems dealing with authority. Even back then, there were signs Cousins had a long memory to go with his talents. As his coach at Kentucky, John Calipari, told ESPN in 2010, "If you pass him in the draft, he will never forget." Another defender of Cousins back then was former Georgetown coach John Thompson Jr., who told ESPN he would be "happy as hell" to have Cousins play for him in the NBA. "I think that you can calm down a fool before you can resurrect a corpse," Thomspon said.